As professional sports seasons begin to wrap up, questions remain — who will win the NBA’s Rookie of the Year award? How will the Golden Knights fare in the NHL postseason? Will Johnny Manziel get arrested again? The Pitt News sports staff is back with a weekly roundup of the best in sports this past week — and we have all the answers. This past Pitt men’s basketball season was a tumultuous experience for both the players and fans. The team went 0-19 in ACC play this season and did not have a single win against a Power Five school — and the once rowdy Oakland Zoo remained deserted. At the end of it all, head coach Kevin Stallings was fired and nine players have requested release, along with the two recruits decommitting from the program. For the past two weeks, the Panthers have been searching for the man to replace Stallings and restore the Panthers to their past successes. This next hire is crucial for the direction of the program and as time passes, the situation looks bleak. Tom Crean is going to Georgia, Sean Miller announced he was not a candidate and Dan Hurley just accepted a six-year deal to stay in the northeast with UConn. Pitt wanted a superstar hire with strong recruiting ties in the region, but all of those are off the market. They need a coach like Brandin Knight. He is currently an assistant coach at Rutgers and he is a former Pitt and NBA player. He is a young, high-energy coach who can use Pitt as his platform to cement himself as a college coach. LeBron James is playing the best basketball of his career and has the chance to go to the NBA Finals for the eighth straight year. If he makes it, this would be the second-worst team he has carried to the finals, just ahead of the 2007 team that lost to the Spurs in four games. James is averaging his most assists ever at 9.1 per game and is scoring 27.4 points per game, which is above his career average. Keep in mind, LeBron is 33 years old and in his 15th year in the league. He is on pace to play in the most games this year since returning to Cleveland in 2014. The Cavaliers this season have been plagued with injury and off-the-court drama. After a hard reset of its roster, the team is still struggling to find their identity, going 11-5 since the All Star break. LeBron has done more with less, and despite the mileage on his body, I wouldn’t be surprised if we saw the Cavaliers back in the finals. The question is, if they make it there, will they fall short yet again? 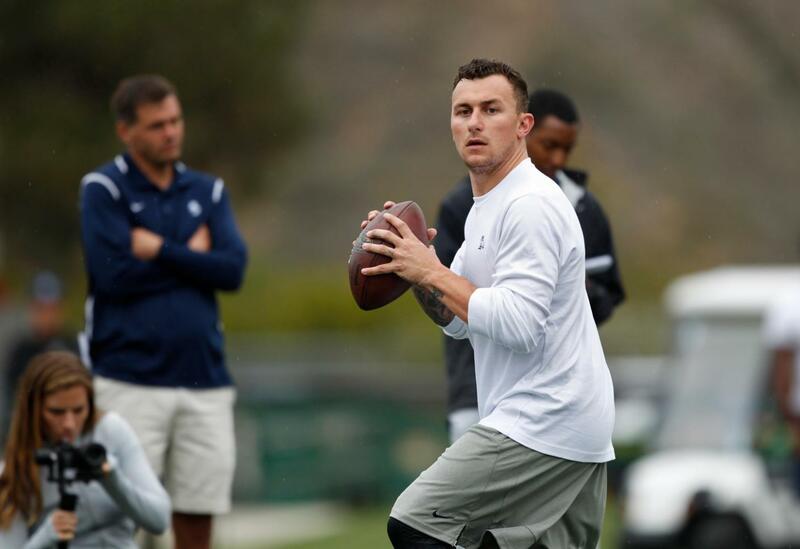 Former NFL quarterback and Heisman winner Johnny Manziel threw at San Diego University’s Pro Day Thursday. Manziel, who was a first round draft pick in 2014 by the Cleveland Browns out of Texas A&M, has not been in the NFL since 2015, mainly due to his problems with drug and alcohol abuse and other charges of domestic violence. Despite his previous troubles, Manziel had 13 NFL teams show up, including the Browns. Manziel didn’t disappoint those who came to watch, completing 36 of his 38 throws in the rain. Still, two questions must be answered within the near future — can Manziel keep up this “good image” he has been portraying lately, and will he even be good enough to play in the NFL again? In two seasons with the Browns, Manziel threw for 1,675 yards with seven touchdowns and seven interceptions in 14 games, which isn’t all that impressive. But if Manziel could replicate the success he had in college or even just play decently in the NFL in the future, it would definitely be one of the best athlete comeback stories in a long time. With the NBA regular season winding down, people are eyeing up the hottest candidates for end-of-season awards — particularly Rookie of the Year. Utah Jazz point guard Donovan Mitchell has received much of the first-season hype lately, as his team won nine of its last 10 games and currently fills the eighth playoff spot in the Western Conference. Mitchell leads all rookies with 20 points per game this season. Mitchell is certainly talented, but there’s only one rational candidate for Rookie of the Year — Philadelphia 76ers’ point guard Ben Simmons. Simmons, despite his reluctance to shoot 3-pointers, is having a nearly unprecedented rookie season. He leads all rookies in rebounds per game (7.8), assists (7.9) and triple-doubles (9) and is second in steals (1.7) and points (16.1). 76ers also sit at fourth place in the Eastern Conference — just 1.5 games behind the Cleveland Cavaliers — after going 28-54 without him last season. Simmons’ only rivals are historic Hall of Fame players — the likes of Magic Johnson, James and Oscar Robertson, who put up comparable rookie numbers — not his peers from the 2017 rookie class. Any argument for Mitchell to be ROTY is a total reach. As the NHL regular season nears its end, there’s a tight race as the top five teams remain separated by eight points. Holding onto fourth is expansion team Las Vegas Golden Knights. The Knights have had a record-breaking season for a rookie squad, becoming the first to even come near the top of the standings. It seems inevitable that the team will lock down a playoff position within the next week, but the question is, how well will the Knights continue their success? With star goaltender Marc-Andre Fleury out with an injury, it seems like the team’s chances of a run for the Stanley Cup may have just gone down. The team doesn’t lack experience or skill, though, which is often what kills teams when they make it to the postseason and causes most expansion teams to have terrible first seasons. Thanks to the new expansion draft, though, the Golden Knights’ roster is filled with veterans, many of whom have brought years of playoff experience to Vegas. The team may be new, but don’t be surprised to see the Golden Knights make a deep run for the Cup this postseason.